Many men and women of Igbo descent have marched to Aso Rock to meet with President Muhammadu Buhari and commend on him on the Operation Python Dance initiate. It has been revealed that several Igbo sons and daughters early this morning marched to the Presidential villa for eulogize the efforts of the Federal Government for introducing the operation python dance to tackle insecurity in the South East. According to The Nation, the exercise, the group said has helped to maintain peace and unity in the South East. 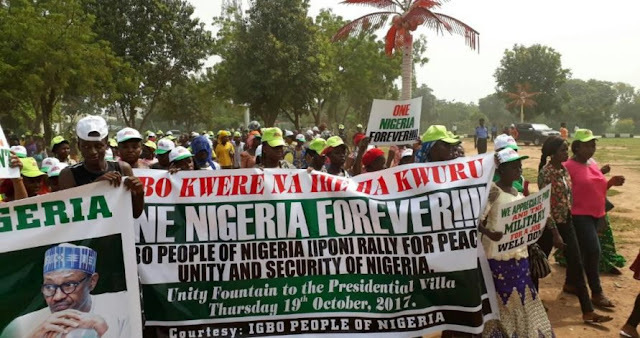 The group under the aegis of the Igbo People of Nigeria, IPON carried several banners with inscriptions such as Igbo kwenu, Buhari kwenu, we appreciate the Nigerian Army among others and numbering over a thousand persons danced with joy to the Presidential villa gate. The National Coordinator of the group, Chief Uche Chegwo who led the march said the ibo people wil forever be greatful to President Buhari and the Nigerian Army. He said, ” Like other patriotic persons from the other ethnic groups, members of IPON have strong faith in the unity of Nigeria and a strong belief that we are stronger together and that we stand to gain more as one strong, united and indivisible entity as opposed to being fragmented into little statelets and micro-nations that are unable to take on the corporate vampires of the world. “That said Mr President, we want to commend your recent engagements with our leaders from the south-east; while these interactions are described as coming late in some quarters, we see the very fact that they are taking place as a confirmation that you are a leader who respond to citizens’ demand. We believe that the promises made to our leaders during their recent meetings with you would begin to translate into actions and concrete results in the days ahead. “We want to point out from our own side that the visit of our leaders to Your Excellency should eradicate any doubts as to where the loyalty and allegiance of Igbo people lie. We are resolutely behind your government even as we categorically affirm that we have no animosity towards state institutions. We cannot and must not be defined by a minority that is vocal and violent – the hatred advanced by the Indigenous People of Biafra (IPOB) and their sympathizers is not Igbo and should not be used as a basis for defining us as a people. The other ethnic groups in the country, among who we co-habit as fellow Nigerians, attest daily to the humility and tolerant nature of the Igbo. “These merchants of hate have strived to create the impression that the only presence the Federal Government have in Igboland is destructive even as they wrongly cast the Operation Python Dance II by the Nigerian Army as of such negative developments. Mr President, we of Igbo People for Nigeria want to report differently. “It took the intervention of the Nigerian Army through its Operation Python Dance in 2016 to rid Igboland of kidnappers and bandits for many of us to again dare setting foot on our ancestral land after several years for fear of being robbed, abducted or killed by hoodlums. Prior to your administration, a lot of our sons and daughters travel all the way from abroad and stay in Lagos and Abuja to celebrate the Yuletide without daring to set foot on the soil of our towns and villages. Operation Python Dance (I) changed that last year as we again breathed fresh air in places of our birth. “Unfortunately, crime has the tendency to mutate. Many of these criminals that were exposed and flushed out during the operation by the Army regrouped under IPOB in order to cash in on the agitation for fairer treatment of the Igbo. They again reintroduced kidnappings, robberies and assassinations, which we reliably gathered were sources of funding for their secession agitation. In addition to these violent crimes, they also raped women and extorted traders while intimidating the wider populace and disappearing anyone that refuses to join them or questions their excesses. “We were therefore elated when the Army launched Operation Python Dance II, which was an appropriate response to the security situation in the south east that was already becoming a killing field as a result of IPOB and other criminal elements who had overran the entire place. Mr President, we want you and your able aides to listen beyond the strident propaganda of those futilely defending the criminality of IPOB; the genuine population of Igbos in the southeast and beyond are happy that these terrorists have been curtailed. May we use this opportunity to laud your administration over the designation of IPOB as a terrorist group and call on the relevant institutions to arrest and prosecute anyone who goes out in the name of IPOB or its affiliate organizations to torment any citizen of the great Federal Republic of Nigeria under your peace. “These agents of darkness who out to discredit us peace loving people have vowed never to stop but we know Mr. President that your antecedent in this area speaks louder for your capacity and the military to bring them to justice. The desperation of these destroyers can be seen in how they circulated fake stories that soldiers were forcefully injecting school children with killer virus in the attempt to discredit the Medical Outreach facilitated by the Nigerian Army. Even though they trended their fake stories on social media platforms, it was soon evident that the reasoning behind the fake story was as flawed and as dangerous as the salt bath and salt solution drink hoax at the height of the Ebola crisis. It was soon proven that the Medical Outreach did not even hold in schools but in churches and palaces of traditional rulers that endorsed it wholesale. “Mr President, while thanking you for your interest in the south-east, we crave your indulgence to help convey our gratitude to the Nigerian Army for the roles they have played in ridding our states of criminals. Our hope is that Your Excellency would take our gratitude as a vote of confidence on the Nigerian Army. Their operation and the relationship they enjoy with the peace-loving population of our area has been very cordial and humane in every ramification. We appreciate the various humanitarian supports that accompany their operations which make it a double-faced sword for law abiding citizens and criminals at the same time. On this note, we assure you of maximum cooperation by the people of the region. “May we further appeal that you use your position as the Commander-in-Chief of the Armed Forces to direct the Nigerian Army to make Operation Python Dance an annual exercise based on the positive impacts it has been able to achieve for the two times it has held. This will also secure the region from secessionists that are attempting to set up a Boko Haram-styled enclave there. “Your excellency is further appealed to not to forget the promises made to our leaders that you have met with as we see the fulfilment of these promises going a long way to dismiss the lies that terrorists and secessionists are telling to the people” he said.